The self-destination is Noxche, the Chechens live in the Chechen Republic (734,5 th.p.) and Dagestan (57,9 th.p.). The Noxche language is considered one of the most difficult and oldest languages in the Caucasus. Its roots can be traced most closely to the ancient Mesopotamians. A cuneiform-style of writing is evident on some of the stone inscriptions, dating at least to 2,800 BC. The Noxche language, as we know it today, is most linked to some of the words used by the ancient Akkhadians, and can be traced at least to 1200 BC.. It is not related to Russian, Slavic, Indo-European or Turkish languages. But linguistic influences from invaders and traders over the centuries, including Mongolian and Arabic, are evident in many words. The Noxche language has a complicated grammar and sounds which are not like any other Caucasus tongue, although our language belongs linguistically to the Nakh branch of Caucasian languages, which include Ingush (galgai) and Batsbi (found in present day Georgia). Despite the fact that the Chechens are predominantly Sunni Muslim today, that was not always so. Before the adoption of Islam, the Noxche people practiced their own blend of religious traditions and beliefs. Like so many ancient cultures and civilizations worldwide, archaeological evidence and modern day practices suggest that their ancient religion was based on cycles of nature and astronomy, with many gods and complex rituals. Artifacts and monuments, as well as burial and sacrificial sites, tell archaeologists alot about their religious beliefs before Islam and Christianity. Petroglyphs in underground caverns high in the mountains, dating from at least 4,000 BC, depict solar signs, anthropomorphic animals, and use of plants for rituals. Ancient underground burial vaults from approximately 2600 BC have carved niches and unusual stones with concentric circles in a variety of manners. Different underground dwellings dating from 1200 BC until the 9th or 10th centuries A.D. suggest a wide variety of gods associated with forces of nature and the stars. Between the 8th-11th centuries, evidence of Christianity and Islam on burial sites and architecture is first observed. By the 11th century, the Georgians try to baptize many people, but without huge success. Islam was slowly introduced over a period of centuries, gaining converts by the 15th & 16th centuries, but not taking root until well into the 18th-mid 19th centuries, with the mountain regions last. Today one can see ancient traditions and superstitions blended with traditional Islamic beliefs and practices. It is unique and unlike any other. Likewise, the land of the Noxche has traditionally been a safe religious haven for persecuted peoples to gather. Small groups of people from Europe and Asia, over the centuries, have come to these mountains to hide. Welcomed by the Noxche people, they settled, and their religious traditions eventually blended with our ancient beliefs and customs. Our land also became a gateway for trade routes, drawing numerous religious and ethnic people to the region to settle permanently. A small number of Christians, Jews, Buddhists, other Muslims and more have a long and rich history in the land of the Noxche. At the turn of the 20th century, there were over 800 mosques, numerous churches, temples and other places of worship, as well as hundreds of Islamic schools. During Soviet rule, religious facilities were mostly shut down, not to be opened or rebuilt until after 1991. Yet, through the entire Soviet period, Chechen religious beliefs survived. 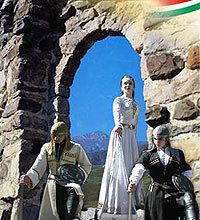 They survived because of our ancient clan structure, and the fact that Chechen law historically was civil and local. Historically, the Chechen lives revolve around their village and clan structures. This is one of the most prominent and important institutions to persist since ancient times. Then, as now, everything centers around village life where elders rule. Taips, or clans, consist of several villages with a common ancestor. Each village can have anywhere from 10-50 families. The Chechens are taught from a young age to name their ancestors back 12 generations or more. Their clans form strong units which, to this day, defend homes, land and extended family. There are more than 125 clans among the Noxche people. All are categorized by a specific "Tukum", which is like a tribe. There are 9 Tukums among the Noxche people. Legend has it that they all share a common family ancestry of 9 brothers. While clans share a common history, language, religion and culture, each taip has their own elder council, court of justice, cemetary, customs, traditions and laws (called adats, which were customary laws). Leadership is by election and feudal relations do not exist. Each clan, or taip, is self sufficient and self contained. They are hard to break apart. The unity of clans, despite blood feuds, has traditionally been strong. It remains strongest in the mountain regions today. The Chechen clan structure has protected them for thousands of years.